OPI Did You Ear About Van Gough | OPI I Sao Paulo Over There | OPI Dutch 'Ya Just Love OPI? | Diptyque Figuire Candle | Orly RIP | Lush Five Gold Rings Bubble Bar | Lush Bar Humbug Bubble Bar | Diptyque Tam Dao Perfume | Oskia Renaissance Mask | Our Tiny Bees Uber Balm | Mac Plumful Lipstick | Fresh Sugar Plum Lip Balm | By Terry Baume De Rose. I absolutely love this time of year! I love everything from the trees changing colours and the leaves falling to drinking chai lattes in the mornings, the spicy scents that are released from Lush and wearing a berry lip colour. Tam Dao from Diptyque smells like Autumn in a bottle to me and I always love wearing it this time of year. I always pull out Orly's RIP Nail Polish for Halloween as given the name, it's a must! The orange glitter reminds me of tiny pumpkins and it looks like you've done a bit of nail art. My skin gets drier as the months get coulder so instead of a normal hand cream, I use a balm to stop my hands cracking. I've been loving this balm from Our Tiny Bees as it only contains seven ingredients so is perfect for my sensitive skin. For my face I've been using this mini pot of the Renaissance Mask from Oskia. If you like the cleanser then you'll love this mask. It helps to keep my skin from flaking and then I follow up with an oil from even more moisture. 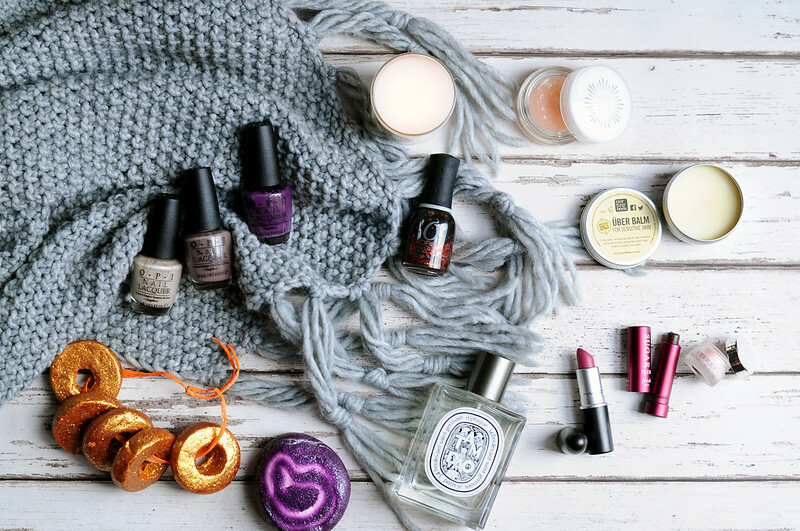 What are your must haves for this time of year? I love the Lush Christmas stuff. I definitely need to go soon and spend my money on a couple of Bath Bombs and Bubble Bars. Love the OPI purple shade! Hand creams are a definite must for me too - my favourite at the moment is one from Soap & Glory! I need to get myself to LUSH to try some of the Christmas stock! Fancy read? Check out my latest pos​t​ |​ FASHION : 20 Cosy Knits for £20 & under!